There are four inhabited islands collectively called the Oki Islands about 60 kilometers off the shore of Shimane Prefecture, in the Sea of Japan. One of the islands, Nakano-shima, is a small island with the area of 33.52 square kilometers and the circumference of 89.1 kilometers, consisting of one town named Ama. The island is located in a sea of fertility blessed with rich seafood resources. It used to be called Miketsukuni (literally 'Land of Food'), which presented fish and shellfish to the Imperial Court in ancient times. It is also famous as an area with a lot of precious heritage and traditions including Shinto music and dance. The slogan of the town is "Naimono-wa-nai" (What we haven't got we do without). The phrase's meaning has two aspects: the town does not need to have what the town does not have, such as material abundance or trendy entertainment, while it does have everything important for life, such as natural blessings, community and a self-sufficient lifestyle. The "Fourth Ama Town Promotion Plan" formulated in 2009 is a ten-year plan to promote a society where every citizen can enjoy his or her life on the island. On January 29, 2008, three young people who moved to this town established a business corporation named Megurinowa (literally 'Ring of Encounters'). Its representative Hiroshi Abe relocated from Aichi Prefecture at the end of 2007 after quitting his job at a major Japanese auto maker. Let's trace back the history of Ama's revitalization plan through Abe's passion enchanted by the town and his company's efforts. The population of Ama Town is now 2,350, having declined by 4,600 from about 7,000 in 1950. The proportion of its elderly population has increased to 39 percent, which means serious aging of the population amid extremely low birthrates. The town's finances were nearly bankrupt due to the reduced population of people in their productive years (the 20s and the 30s), rapid reduction in public investment, and enormously reduced amounts of local grant tax. To find a way out of this crisis, Michio Yamauchi, who was elected mayor in May 2002, exercised strong leadership to push through bold reforms. The first thing he did was to bring about a change in the consciousness of local government officers and citizens. He not only cut his own salary by 50 percent but cut various other expenses as well, including labor costs. In March 2004, the town implemented the "Ama Town Self-reliance Promotion Plan" to fight for survival with the cooperation of citizen representatives and the town assembly. The plan adopted an aggressive strategy of investing in a population policy (settlement policy) and industrial promotion. With the key words of sea, ocean breeze and salt, the long-term industrial promotion strategy has been to "brand the whole island" through the effective use of local resources. Two strategies were strengthened: (1) expansion of local production for local consumption while widening exchanges among people living on and off the island; and (2) large-scale promotion of value-added goods to be sold throughout Japan (to obtain "foreign" currency). For example, Ama Town introduced a special refrigeration technology, known as the Cells Alive System (CAS), which rapidly freezes food items while vibrating their cells with the use of magnetic field. This process can preserve food without damaging cells during the freezing process. With the CAS, Ama's marine products stay fresh during transport to other areas. The town now sells seafood products such as white squid, farmed rock oysters, porgies, dried laver and seaweed to Tokyo and other major markets through its own outlets. In 2004, Ama Town launched a livestock industry project under the national government's special zone program for structural reform. With the help of the town, a private company started raising beef cattle with the brand name "Oki-gyu (Oki beef)." It has successfully established the brand, which enjoys a good reputation. It is now said that Oki beef is comparable to Matsusaka beef, one of the most famous beef brands in Japan. In this way, the town has made a concerted effort to become self-reliant. It created new industries based on its local resources, which generated new jobs and also revitalized jobs in the primary industries. The town has entered into a virtuous cycle. The key driver of its success is the presence of "outsiders" who have taken a leading role in discovering the charms of Ama which its residents had not noticed, and in connecting the merits of these charms to the development of specialty items and tourist products. Abe's first visit to Ama was in December 2006. One of his colleagues at the time invited him to visit the town, saying "There is an interesting island which is aiming to become a model of a self-contained sustainable society." When he first visited Ama, a section chief of the town office showed him around, and provided a chance to chat over drinks with town office staff and residents of his own generation who had returned to the island where they had grown up or moved in from urban areas. "Their enthusiastic talk about the future of the island was so impressive that I desperately wanted to be part of it," Abe says. Abe made three more visits to Ama. In May 2007, one year after his first visit, he decided to quit his company and move to the island. He felt that the whole island was engaged in carefully creating a favorable environment for newcomers, while providing would-be residents with consultation services about jobs and daily life on the island. This perception pushed him to make up his mind. Later, a staff member of the town office said to him, "We were working hard to attract 24 people, or one percent of the town's population, because we heard that a community will change when it receives aspiring newcomers numbering about one percent of the population." Abe realized that Ama's settlement strategy was already targeting him when he first visited the town in 2006. Ama had launched its strategy to facilitate newcomer settlement in fiscal 2004, having decided that depopulation was a serious problem undermining the basis of residents' lives and disrupting the whole island. Since then, Ama has implemented carefully planned measures, such as improving housing conditions and eliminating concerns about starting a new life on the island. Results were clearly shown by the number of people that moved to the island over seven years; 310 new arrivals from cities and 173 island natives who returned to their hometown. In 2005 alone, 91 people settled in Ama. In terms of the Japanese population as a whole, this percentage would be equivalent to about 4.5 million immigrants into Japan in one year. During his student days as a metal researcher, Abe had been seeking a way to develop zest for living through outdoor activities, organic farming, and backpacking. His career plan in those days was to work in a company to develop his experiences and skills, and, at around 40 years of age, to start his own business, which would also give him space to raise questions about current social situations. His entrepreneurial plan was realized about ten years earlier thanks to his encounter with Ama. This is the story of the birth of Megurinowa. "People can do work beneficial to the local community, enjoy life with local friends, eat safe and tasty food, earn money in a proper way, and live with their family happily, even if they do not work in a big firm or live in a big city." This is the vision of Megurinowa, which hopes to help people realize a self-sustaining living by doing meaningful work for a decent wage in our money economy. Abe's company is tackling the challenge of creating a new society in which people make a good use of local resources, and live in harmony with others and the natural environment. One of the company's main services is conducting educational tours for off-island companies, municipalities and colleges. These tours do not provide made-up programs but set up chances to learn from the island by experiencing its life and seeking mutual understandings with local residents. The participants are expected to find clues that will lead them to their next stage. In future, Megurinowa aims to establish a school modeled on Schumacher College in the United Kingdom, where students can learn about the relationships between the earth and our society, and strengthen their sense of humanity through the experience of living on the island as a way to help them decide what to do next with their lives. After the Great East Japan Earthquake, the company started a volunteer effort program in Watari Town, Miyagi Prefecture, one of the hard-hit areas. 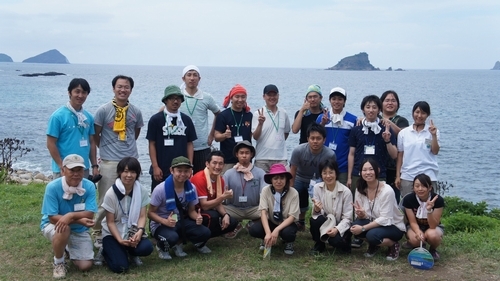 The project is planned and operated mainly by staff originally from Miyagi. To promote local tourism and make it easy to volunteer, tour participants stay at a hot spring hotel while helping disaster victims. The above-mentioned self-learning process is also incorporated into the program. "The value system that I find worthwhile identifies what we want to keep and what we need to change in order to accomplish that," Abe says. He thinks Ama should keep its traditional sense of awe regarding nature and ancestors. Such things comprise the force and spirituality of a place, and cannot be encompassed in a single lifetime, but exist beyond time and space in an unbroken tradition. In Japan, the population drain and aging of society are becoming more prevalent especially in mountainous areas and isolated islands; these trends are now rapidly progressing in areas struck by the earthquake. What must we change in order to be able to hand down the universal treasures which exist naturally in daily life lived in a particular place? A society where everybody lives happily with nature may be realized, not through the pursuit of economic growth or the desire for goods, but by finding new thought patterns. The way Ama is meeting the challenge of revitalizing its regional economy can help us learn this lesson.